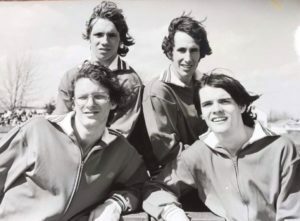 During the track season in the spring of 1974, Cavanaugh took several members of his track team to Mansfield, OH to compete in one of the premier high school track competitions in the nation. XC veterans McEwan, Mulvihill, Sanidas and Wishnevski won the two mile relay and finished 3rd in the four mile relay. Quite an achievement against the best competition in the country. 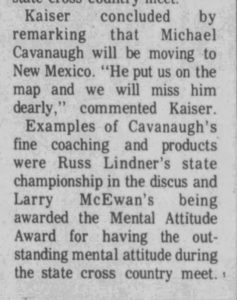 In the spring of 1974 Coach Cavanaugh decided to move his family to New Mexico. During the spring sports banquet, where Cavanaugh had coached the team to their 4th consecutive Duneland Conference track title, Athletic Director Jerry Kaiser told the assembled group what Mick Cavanaugh had meant to PHS and the sports program. 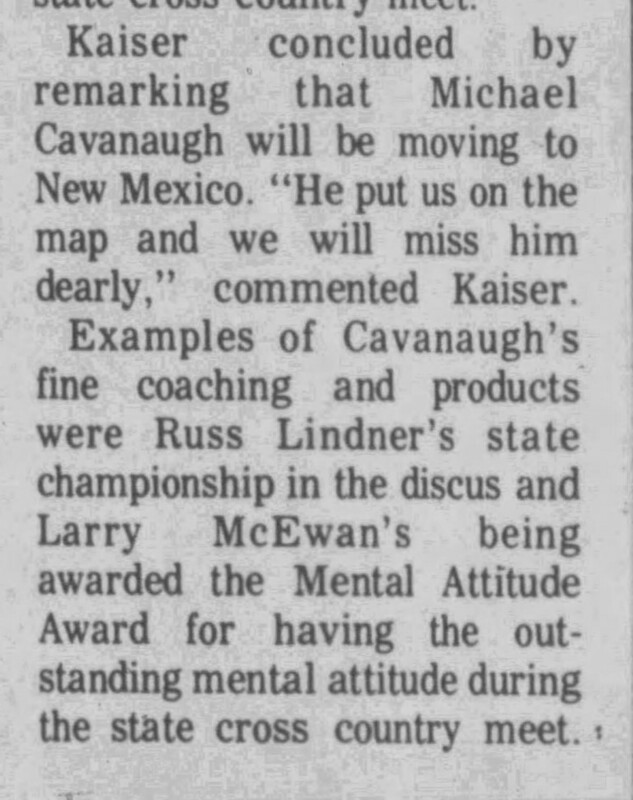 At the end of the school year Coach Cavanaugh left the PHS school system for New Mexico. In six years the mark he made XC in the region and statewide can not be overstated. 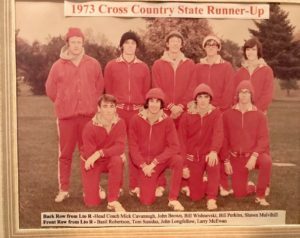 As the title says: Mick Cavanaugh: The Coach who put Portage Cross Country on the map. Regionals: 1st Portage team to compete in regionals (’70). 1st to win regional title (’73). Dual meets: Six winning seasons. PHS had only had two in the first 22 years of fielding a team. 69 wins 15 losses, 82% winning percentage. * Duneland Sports trophy: PHS won the Duneland Overall Sports trophy ’71, ’72, ’73 and ’74 school years. XC and track teams figured greatly in the school winning the award. As this article opened with, in the fall of 1974 Cavanuagh’s successor, Bill Wilkie, would win the school’s first IHSAA championship trophy. After that first championship trophy, Coach Wilkie would lead PHS teams to three additional state championships (’84, ’92 and ’99), six second place finishes and five third place finishes. 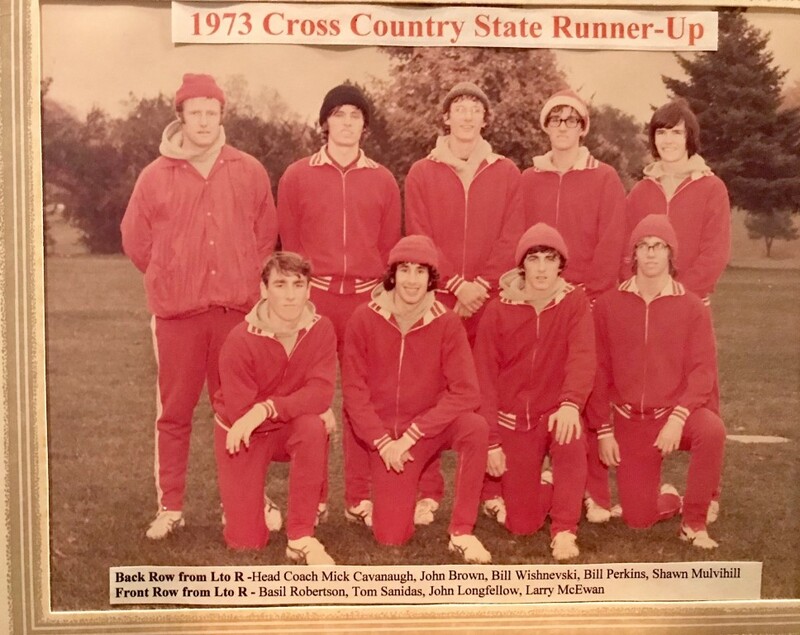 It should be noted that Tom Sanidas would become a teacher and coach in the Portage school system and help develop many middle school XC runners who would go on to make trips to the truck in Indy and bring home hardware under Wilkie’s coaching at the high school level. Wilkie has been inducted into the Indiana (Coaches) Track and Cross Country Hall of Fame. With his resume, Wilkie is a legendary coach. Though Cavanaugh lacks Hall of fame credentials, his achievements are also considered legendary. Simply put, he took a XC program that had only had two winning seasons in 22 seasons and in six years complied a resume that most XC coaches would desire. As of this writing, in October 2018, Coach Cavanaugh is acting as a volunteer coach for his HS alma mater the Valparaiso HS girls cross country team. He returned to the area in the late 80s and has assisted the VHS program, which has won several state titles. 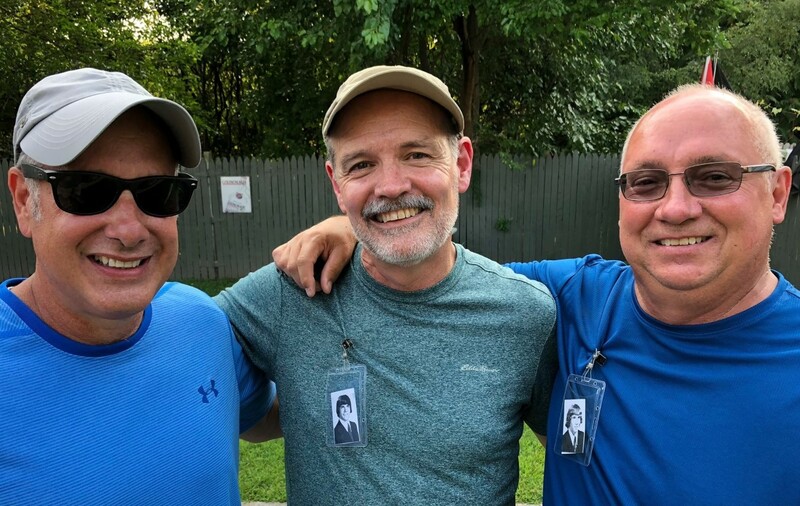 In August 2018, three members of Coach Cavanuagh’s final PHS XC team got together at a reunion in Portage. The author, a ’74 classmate, was honored and thrilled to see these guys laughing, smiling and enjoying the memories of Coach Cavanaugh’s final season, which included a second place finish at the state meet.